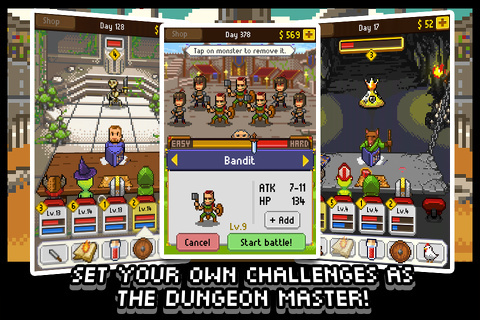 Knights of Pen and Paper is a great iOS take on turn-based RPGs with western influences. This app by Behold Studios requires iOS 4.3 or better and can be played on the iPhone 3GS and up, iPod Touch 3rd generation or higher, and any of the iPads. It is optimized for the iPhone 5. Knights of Pen and Paper is based on real life pen and paper games like Dungeons and Dragons with a Dungeon Master and references to the real world like Stonehenge, the end of world (Mayan calendar), and many more. This game is simple but has features a turn-based RPG fan will enjoy. Controls are simple; all you have to do is tap when applicable. Tap the screen to open up the menu and various icons will appear depending on your location. Tap on the swords to fight monsters that dwell in that location. Map to see and pick where to go next by a star. Tents are used for recovering health and mana but there is a chance of being attacked. Beds are the same as tents except you won’t get attacked and they are found in villages and castles. A chest is used to see what items you are carrying, equipped to your characters, and to sell or discard items depending on where you are. An exclamation mark is used for selecting quests and tapping on it when you completed one will give you your reward. An anvil represents the blacksmith and he can upgrade your character specific equipment for a price and he has success rates and waiting time to craft again. Level up the blacksmith to reduce wait time and increase success rates. A cauldron represents the enchanter who sells items and equipment with a level requirement. A gear is used for system settings for music, audio, language and saving and quitting the game. A twenty sided die which has a predetermined roll is used for quests that have a random chance for battle and for the chance of mining grindstones (takes two hours to reset but can be bought with gold) which level up the blacksmith. There are a variety of quests such as kill quests, rescues, gather, etc. Some quests help the story move along while others unlock characters and classes for you to use when you complete them. When you battle, tap on a weapon or enemy to damage an enemy, book to use spells and skills, the red potion to use items on that character only, shield to defend, and the chicken to run away which requires a die roll. Traveling to an area requires gold and when you first play the game can be daunting. This gets easier as you go along and fight more than one monster at a time if you can handle it. It also helps if you get Shop items which is found on the upper left of the screen. These items cost a chunk of gold but helps by giving ten percent more gold, more experience points, more health, reduce crafting time, increase your attack by one point, reduce travel cost by ten percent, granting HP and MP regeneration, and reduce resurrection cost, or increase consumables’ effect duration. I recommend focusing on buying the permanent yet interchangeable items first so avoid buying snacks and drinks. When you first start out, pick characters and classes that fit your way of playing and take a look at their passive skills, magic, and usable skills. Adding more characters than the first two (max of five character slots) cost gold. Try not to rush or fight too many monsters at once otherwise it’ll be costly to revive everyone. When this happened to me, I deleted the file and made a new one and tried out different characters and classes. You keep the permanent Shop items and gold when you delete a save file. The graphics are fantastic, pixel art with a variety of colors and details. The only problem I have are some enemies have the same facial structure and a few are palette swaps. I greatly enjoy the references such as Stonehenge emitting a pulsing beam of light, the name of a location called Wizards of the East Coast, a Beholder monster, Missing No. from Pokemon , and a countdown to the end of the world (this is gone after the latest update). During fights, you can see the enemy move, your attacks landing, spells and skills being performed, and critical attacks appear with an exclamation mark. It’s a little strange to see your characters sitting on chairs with a game master and a table with various items strewn across while fighting a bear but I guess that’s one of the reasons why I like this game. The audio is enjoyable but gets somewhat boring after a while. It has various tunes and sound effects but the battle music is the same over and over again. I like some of the sound effects such as when you mine. There is no iPod music support but I didn’t think this was needed. I would like more variety for music such as music depending on the area you are in. 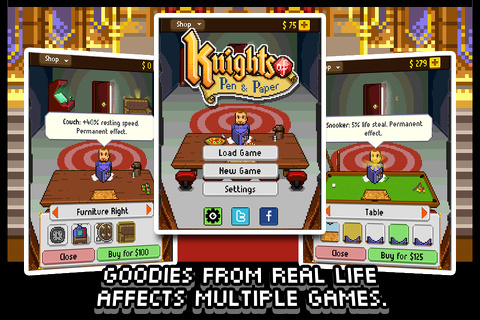 Knights of Pen and Paper sells for $1.99 on the iTunes App Store. There are in-app purchases of gold but they are not necessary. I like this game and I think it’s a keeper but there are some problems that should be addressed. At the time of this review, I am unable to use items on other characters during battle, the game pauses sometimes, buying and navigating through the item list from the enchanter is cramped and sometimes you tap on something by accident, and the campaign that was taken out where you fought in a coliseum or something like that. Other than the mentioned problems, this is one of the best turned-based RPGs made for the iOS. Some recommendations I have are; use the thief and a healer class when you first start out, the thief can disable an enemy for a turn, put your skill points into attack for characters that have it, buy the permanent Shop items that give more gold first, if you die just make a new save file and play with different characters and classes to see what you like. Good luck and be careful of high level areas. AppSafari review of Knights of Pen & Paper was written by Tony Lau on March 14th, 2013 and categorized under Adventure, App Store, Featured, Games, RPG. Page viewed 4838 times, 2 so far today. Need help on using these apps? Please read the Help Page.